High activity in a relatively poorly studied group of brain cells can be linked to aggressive behaviour in mice, a new study from Karolinska Institutet in Sweden shows. Using optogenetic techniques, the researchers were able to control aggression in mice by stimulating or inhibiting these cells. The results, which are published in the scientific journal Nature Neuroscience, contribute to a new understanding of the biological mechanisms behind aggressive behaviour. Aggression is a behaviour found throughout the animal kingdom that shapes human lives from early schoolyard encounters to armed, global conflict. Like all behaviour, aggression originates in the brain. 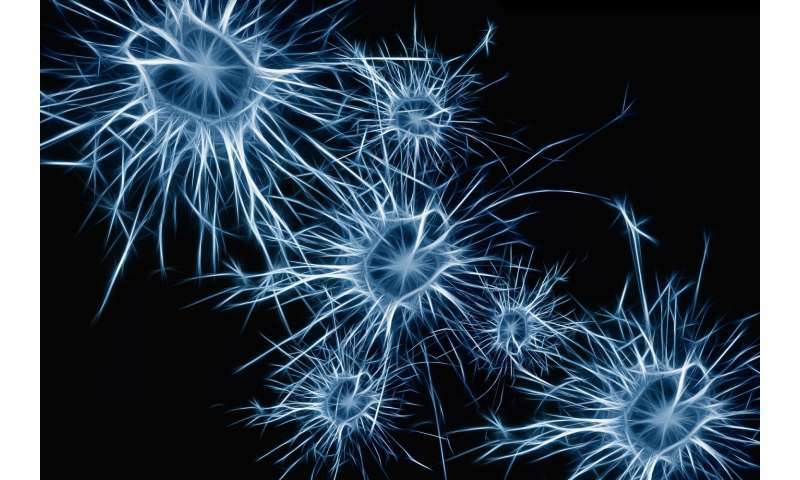 However, the identity of the neurons involved, and how their properties contribute to the stereotyped expression of interpersonal conflicts, remains largely a mystery. Researchers at Karolinska Institutet now show that a previously relatively unknown group of neurons in the ventral premammillary nucleus (PMv) of the hypothalamus, an evolutionarily well-preserved part of the brain that controls many of our fundamental drives, plays a key role in initiating and organising aggressive behaviour. Studying male mice, the researchers found that the animals that displayed aggression when a new male was placed in their home cage also had more active PMv neurons. By activating the PMv through optogenetics, whereby neurons are controlled using light, they were able to initiate aggressive behaviour in situations where animals do not normally attack, and by inhibiting the PMv, interrupt an ongoing attack. The mapping of the PMv neurons also showed that they, in turn, can activate other brain regions such as the reward centres. "That could explain why mice naturally make their way to a place where they have experienced an aggressive situation," says the study's lead author Stefanos Stagkourakis, doctoral student at the Department of Neuroscience, Karolinska Institutet. "We also found that the brief activation of the PMv cells could trigger a protracted outburst, which may explain something we all recognise—how after a quarrel has ended, the feeling of antagonism can persist for a long time." Aggression between male mice is often ritualised and focused less on causing harm than on establishing a group hierarchy by determining the strongest member. This can be studied experimentally in the so-called tube test, wherein two mice encounter each other in a narrow corridor, from which observations can be made about submission and dominance. By inhibiting the PMv cells in a dominant male and stimulating the same cells in a submissive male, the researchers were able to invert their mutual hierarchical status. "One of the most surprising findings in our study was that the role-switch we achieved by manipulating PMv activity during an encounter lasted up to two weeks," says study leader Christian Broberger, associate professor at the Department of Neuroscience, Karolinska Institutet. The researchers hope that the results can contribute to new strategies for managing aggression. "Aggressive behaviour and violence cause injury and lasting mental trauma for many people, with costly structural and economic consequences for society," says Dr. Broberger. "Our study adds fundamental biological knowledge about its origins." Hopefully Republican children will be able to have these neurons destroyed before they become gun grubber adults. Aggression and competition are linked. Competition drives evolution. Trying to eliminate competition is not even wrong.